This exceptionally rare piece of medieval enamelled silver was probably intended for display, and would have been greatly valued. Jean, Duc de Berri, a great patron of the arts whose wealth rivalled that of his brother the French king,CharlesV, had a similar cup in his collection. Plique à jour was the most difficult enamelling technique because it involved firing the glass into cells and removing the backing, to create an effect like stained glass. A pricked pattern of vine scrolls and birds can be seen on the silver cup. Conical beaker with translucent enamel panels on body. Silver-gilt and plique-à-jour enamel (the cloisons gold). The flaring body is pierced round the centre with four trapezoid panels alternating with three pointed windows. On the inside these are plain, and are separated by the bands left in the metal. Over them on the outside are applied four curved oblong panels and three pointed panels of plique-à-jour enamel, held in moulded frames decorated with applied leaves. The lower part of the pointed panels is divided into three vertical pointed lights alternately green, blue and green. These are surmounted by three quatrefoil lights of tracery, filled with clear enamel, and surrounded by blue. The vertical pointed lights each contain three crosses in gold cloisons: at the top and inside the ovals they have touches of white enamel. The trapezoid panels are decorated with a design of a scrolling plant, the stems represented by the cloisons, the leaves and flowers by blue and yellow-brown enamel, on a ground of green translucent enamel. Above and below the outside is decorated with pounced designs. Each of the three sections into which the pointed frames divide the upper part is pounced with a different foliated stem, a branch of oak-leaves with acorns, a vine-stem with grapes, a rose-stem with roses. Round the lower part are pounced two foliated scrolling stems, one of roses, and the other of vines, with bunches of grapes. On each of these two stems is perched a peacock. The base of the body is encircled by a girdle. The upper part of the foot slopes downwards and is decorated with pounced rosettes. It too is encircled by a girdle. Below is a vertical band stamped with sunk circles, each of which is pierced with a hole (for the attachment of pearls?). To this is soldered a twisted wire, of smooth and ridged coil alternately: to this in turn is soldered the base ring. The base is separately made. It consists of a circular plate, with turned-down, serrated edge visible underneath. In this plate, in the inside of the beaker, is cut a circle, under which is fitted a print of plique-à-jour enamel, with a design of scrolling foliated stems on a ground of green. The stems themselves are represented by the cloisons: they emerge from a central trefoil enamelled in clear enamel and orange: the flowers are executed in blue or yellow-brown, their calyxes of yellow-brown where the flower is blue and vice-versa. Some of the leaves are executed in blue, the others in clear enamel. The enamel is backed by a separate plate underneath it held by a rim with serrated edge and a girdle. The rest of the inside of the goblet is plain. The lid is conical, with machicolated rim and a side stamped with sunk circles, each pierced with a hole, as on the foot (for the attachment of pearls?). The side is framed by two girdles; above the upper is a twisted wire like that on the foot. The lower part of the lid is pounced with a continuous scrolling stem of roses. Above, the lid is pierced with three trapezoid panels alternating with three pointed windows. On the inside these are plain and separated by bands left in the metal. To the outside are applied three curved oblong panels and three pointed panels of plique-à-jour enamel, held in moulded frames decorated with applied leaves. The colours and motifs are the same as those on the corresponding panels of the body, except that the lights and ovals are touched with red, not white enamel. Each of the three divisions formed by the pointed windows contain a stem of roses. The top of the cone is pounced with rays. The finial begins with a ring of eight flat-ended bosses alternately decorated with applied leaves (both above and below) and a pounced rosette above. From this rise eight tiny pointed leaves encircling four great leaves enclosing a spike on which was probably set a fruitelet or knob in the form of a precious stone. Provenance. Purchased (£400) from Mr. Edward J. D. Paul, 13 Grosvenor Gardens, London. A memorandum by Mr. Edward Paul of 10 June 1872 states ‘This curious cup was purchased by the grandfather of the present owner in the year 1828 from the Comte de Mérode at the Hague, in whose family it had been handed down for several generations. It was supposed to be a unique specimen . . .’ Mr. Paul’s grandfather was the collector Henry Bevan. The Comte de Mérode from whom he bought the beaker has not been identified, but was presumably either Charles-Guillaume-Ghislain (1762-18 February 1830) or one of his sons – Henri, Félix, Frédéric or Werner (for these see Académie Royale des Sciences, des Lettres et des Beaux-Arts de Belgique, Biographie nationale, xiv, `897, s.v.). While still in Bevan’s collection it was reproduced and described by Henry Shaw (The Decorative Arts ecclesiastical and civil of the Middle Ages, London, 1851, No. ) as ‘a German beaker of the fifteenth century’ with the qualification that ‘the form of the windows, and the character of their tracery are evidently copied from types belonging to the preceding one’. The finial was already missing and Shaw notes that in his drawing it had been filled in with berries to give the beaker a more complete appearance. He says that ‘it was bought by Mr. Bevan at Antwerp many years ago and is no doubt of Flemish workmanship’. This contradicts Paul’s record as to its provenance, but the difference is of little significance, since in 1828 The Hague was the capital of the United Kingdom of the Netherlands. In June 1862 the beaker was exhibited as the property of Mrs Paul at the Special exhibition of works of art of the Mediaeval, Renaissance and more modern periods held at the South Kensington Museum (now the Victoria & Albert Museum). The Catalogue (p. 375, No. 4800, entry compiled by A. W. Franks) describes it as ‘German or Flemish in design, and of late fourteenth or early fifteenth century work’. In 1867 A. Darcel (Musée du Louvre: notice des émaux et de l’orfèvrerie, Paris, 1867, pp. 71-2) compared it with a goblet listed in 1413 in the inventory of Jean, Duc de Berry (see below), but agreed with Shaw in thinking it German. J. Labarte (Histoire des arts industriels au moyen âge et à l’époque de la Renaissance, iii, 2nd ed., Paris, 1875, p. 35) suggested an oriental origin for the beaker, a very bizarre attribution. J. Hungerford Pollen (Ancient and Modern Gold and Silver Smiths’ Work in the South Kensington Museum, London, 1878, pp. 79-80) catalogued it tentatively as Burgundian or Flemish, with the rider that ‘it is of doubtful nationality, perhaps after all Limoges work’. At the 1862 exhibition the cup created much excitement, since before that date the technique of plique-à-jour was known only from the famous description in Benvenuto Cellini’s Trattato della Oreficeria. Doubts had even been cast in the 1850s on the accuracy of Cellini’s statements. During the second half of the 19th century the uniqueness of the cup excited doubts about its authenticity. These were recorded and dismissed by E. Molinier (L’émaillerie, Paris, 1891, p. 250), rightly, since the style and provenance of the piece, its date of acquisition by Bevan and the condition of the enamels are alone sufficient to guarantee its genuineness. It is now the standard early example of the technique of plique-à-jour and is cited as such by E. Molinier (Historie générale des arts appliqués à l’industrie, iv, L’orfèvrerie religieuse et civile, pt. I, Paris, 1900, p. 222) and M. M. Gauthier (Emaux du moyen âge occidental, Fribourg, 1972, pp. 292-93). Historical significance: An extremely rare piece of medieval enamelled silver. The translucent enamels are the earliest known of their type. Plique à jour was the most difficult enamel technique to master because it involved firing the glass into 'cells' made from gold wire, then removing the backing to create an effect like a stained glass window. The cup was probably intended solely for display and would have been highly valued. Jean, Duc de Berri, a great patron of the arts whose court rivalled that of the French King (and is known mostly for his highly colourful Book of Hours, Les Très Riches Heures), had such a cup in his collection. 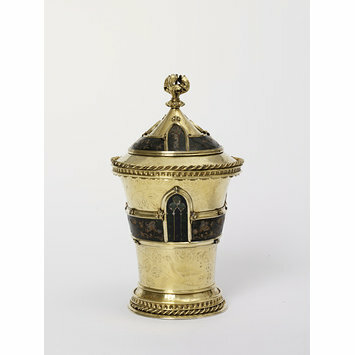 The beaker is undoubtedly what was termed a gobelet in medieval France and Darcel very rightly compared it to a gobelet of silver-gilt listed in the Berry inventory of 1413 which was decorated in much the same manner and probably in the same technique (Inventaires de Jean duc de Berry, ed. Guiffrey, i., 1894, p. 216, No. 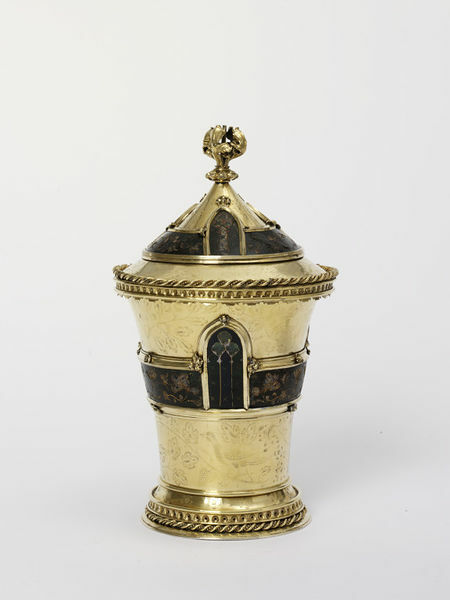 834: ‘Item, un goubelet d’argent doré, couvert, ouvré de tabernacles et fenestraiges d’argent blanc et d’esmail de plusieurs couleurs en manière de voirrières, séant sur trois ours d’argent dorez; et sur le fretelet a un outre ours’). Madame Gauthier (loc. cit.) also suggests a comparison with a gold goblet in the 1413 Berry inventory (Inventaires, vol. cit. , pp. 207-08, No. 798: ‘un goubelet d’or et d’esmaulx de pelite, couvert, ouvré très richement à jour de petites florettes de plusieurs couleurs; et ou fretelet du couvercle a un balay roont’). The beaker is unmarked, and in consequence its place of origin is undetermined. Of the three countries put forward, Germany, Flanders and France, Germany is perhaps the least likely. The real question is whether the beaker was produced at the Burgundian court in Flanders or in France, either at Paris or in some princely workshop elsewhere – the extreme refinement of the technique of plique-à-jour limiting the choice to these alternatives. The provenance as recorded by the vendor gives little help in answering the problem, since it indicates only that the Mérode family had owned the beaker ‘for several generations’, not that it was made for an ancestor of theirs. Since no comparable beakers are known, the question cannot be decided categorically, and the attribution, ‘French or Burgundian’ has been preferred. Madame Gauthier assigns the beaker to Paris, with a tentative rider that it may be Burgundian, and dates it c. 1400. Glanville, Philippa. ed. Silver. V&A, 1996. This extremely rare piece of medieval enamelled silver was probably intended for display and would have been highly valued. Jean, Duc de Berri, a great patron of the arts whose court rivalled that of the French King, had such a cup in his collection. Plique à jour was the most difficult enamelling technique because it involved firing the glass into cells and removing the backing, to create an effect like stained glass. On the silver body the delicately rendered friezes were created by pouncing, using very fine punches. A covered beaker of silver-gilt, decorated with pointillé engraving and translucent enamels in openwork ("émail de plique à jour").